If you invested in Yahoo the day before Marissa Mayer was announced as the new CEO you’re probably pretty happy right now. 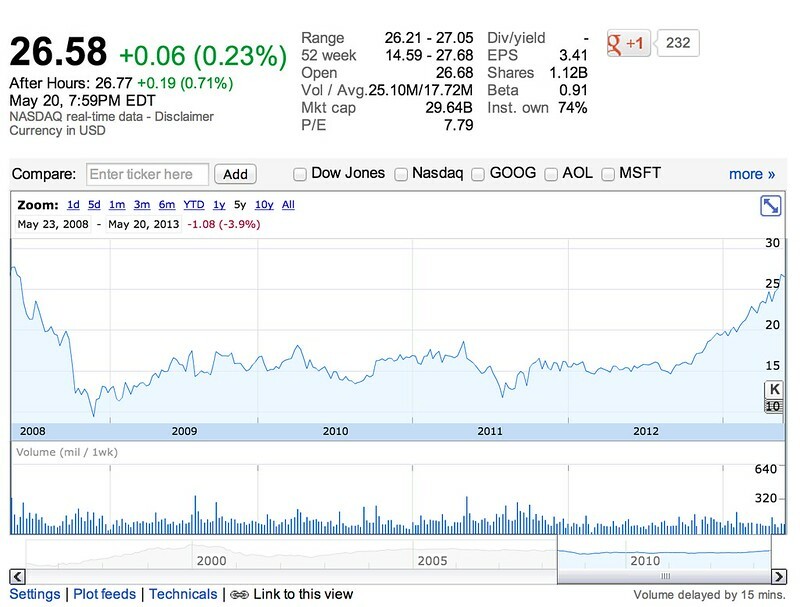 The price has climbed from $15.36 per share on July 15, 2012 to close at $26.58 today – a 73% gain. For long suffering employees with underwater stock options and shareholders waiting for the price to move this undoubtedly comes as a welcome change. Yahoo’s stock price is now at it’s highest since May 2008 thanks to a steady stream of acquisitions including the purchase of the Tumblr blogging service for $1.1B today, policy changes and other positive PR for the company. While this is still a far cry from the 10 year high in late 2005, or peak price of over $100/share in 2000 prior to the dot-com crash, Mayer has done more to move the needle in her 10 month tenure than the 4 predecessors who came after Jerry Yang’s departure in 2009. Scroll down to see Yahoo vs. Google stock price growth comparison for the past year.